You really have to hand it to Betsy Ross. She knew what she was doing. 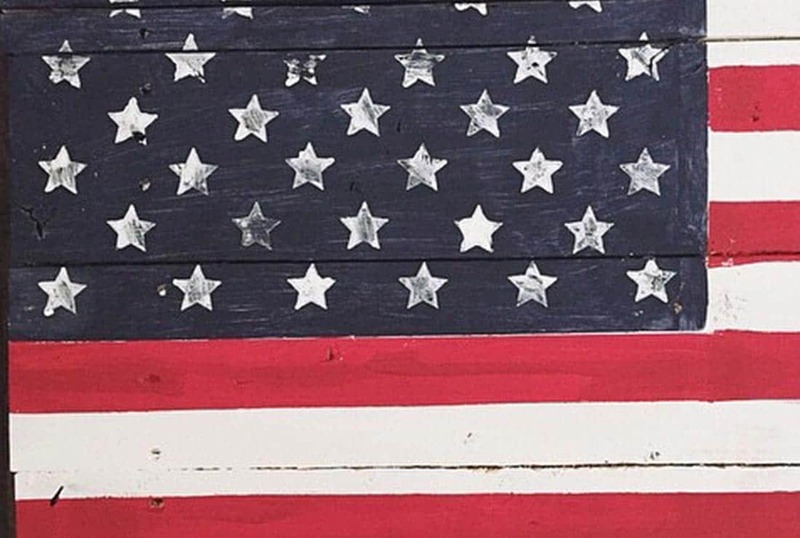 The American Flag design is so simple, yet so distinctive and also open to beautiful interpretations. Do I sound patriotic? Well, yes I am! 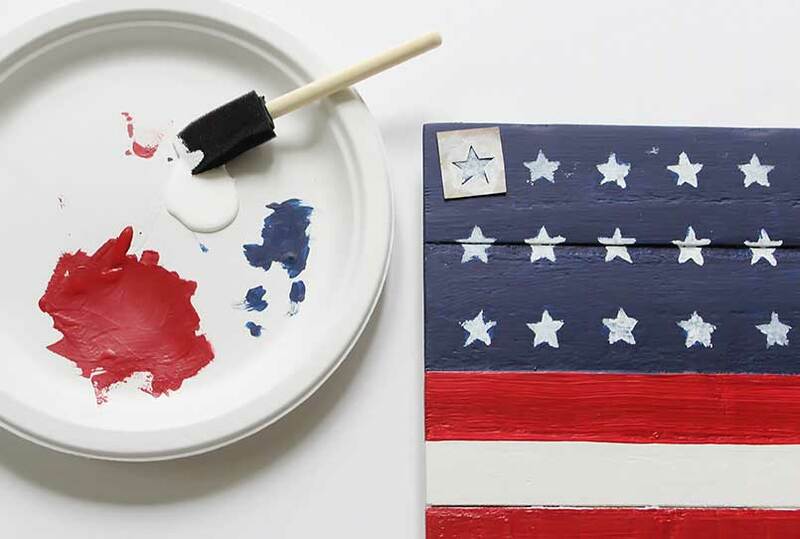 Gather up your favorite kids or girlfriends, and let’s prepare for the Fourth of July by creating our own version of this iconic slice of America. 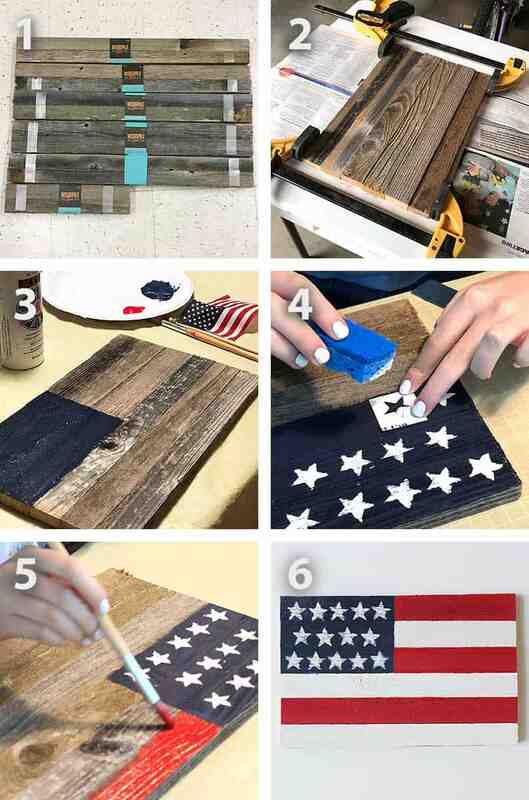 We will transform a piece of rustic wood into an American Flag with today’s easy DIY. This craft project is about embracing your imperfection! The less accurate the better, like Folk Art, which according to Webster, is the traditional art of untrained people. Folk Art is characterized by a naive style, in which traditional rules of proportion and perspective are not employed, according to Wikipedia. I love that, don’t you? It’s all about being human. And imperfect. In fact, if the art is perfect, it’s actually not as appealing. The more mistakes the better it gets. Is this a message to us about life? Maybe so. As a graphic designer, I was taught to practice fine craftsmanship in college. We were held to high standards and I have practiced this for 30+ years in my own design work, so imperfect art is against all of my instincts. Surprisingly tho, it is so freeing, fun, and a wonderful form of therapy. If you hear a voice within you that says “you can not paint” then by all means paint and that voice will be silenced. The materials are inexpensive and easy to find. Your most important item will be the wood “canvas”. Old, rustic wood or planks from a pallet would be an amazing choice if you happen to have access to that. If not, there are a variety of options at your local (or online) craft store. We found ours at Hobby Lobby. Select a pre-made wooden signboard, or buy planks and glue them together yourself. Also, consider checking out the clearance section and purchase a ready-made sign and paint over it, for a fraction of the price. 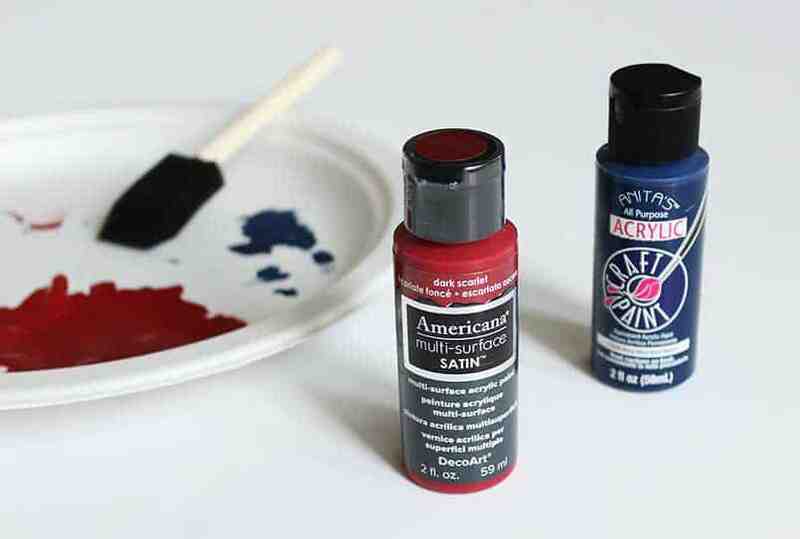 Next, you will need paint and inexpensive brushes. 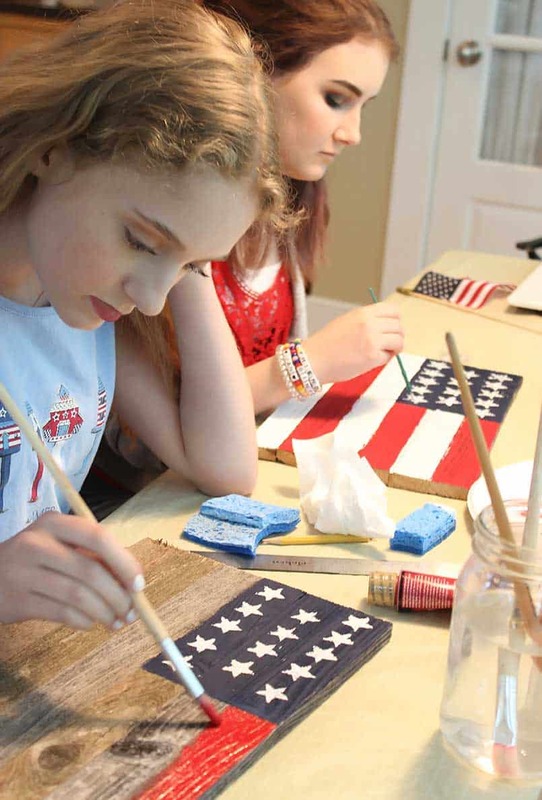 To roughen up or “age” the surface of the wood after the flag is painted, you will also need sandpaper. 1 Select your materials. Download FREE Star Template PDF for inspiration. 2 Glue your wooden planks together if necessary and trim to the desired size. 3 Prepare your paint and brushes. Start painting with the blue first. Let dry. 4 Stencil or freehand paint your stars with white. Let the paint dry. 5 Paint your red stripes. Let dry. Paint your white stripes. Let dry. 6 Great job! Now you can roughen the surface and/or edges with sandpaper if you like. 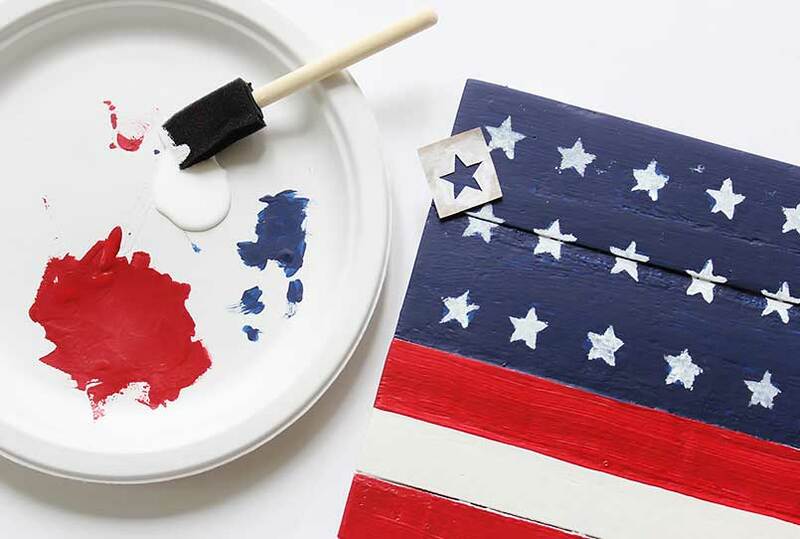 This is a great project for kids to celebrate the Fourth of July. It’s also a fun piece to hang up year-round! I hope you will give it a try and please tag me if you do!